I am honored to announce that my novel, Kitty’s War, has been added to the Local Author Collection at the Jacksonville Public Library in Jacksonville, Florida. 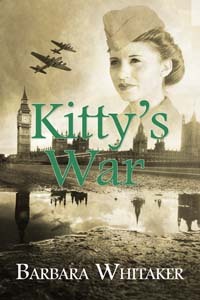 My debut novel, “Kitty’s War,” has just been released by The Wild Rose Press, Inc. The historical romance is set during the turmoil of World War II. See the story description below. Please spread the word about my novel to everyone you know – your spouse, daughters, mother, significant other, friends, co-workers, neighbors or any readers you think would enjoy a story filled with the danger, excitement, heartache, friendships and love in this fascinating time period. “Kitty’s War” is available in either print format or e-book format online from my publisher, The Wild Rose Press, and from Amazon. The e-book is also available on iTunes , Kobo , and Books-a-million . To receive emails from me periodically with updates on my novels, my research, and whatever other interesting information that I might come across, please send me an email using the “Contact” form on this website. I will add you to my newsletter mailing list. I plan to send emails only three or four times a year so I won’t overwhelm you. If you are not interested, that’s okay. If you ever change your mind, you can always contact me via this website. My first novel, Kitty’s War, will soon be published by The Wild Rose Press. I’ll post an update when I have an official release date.